Her Body and Other Parties took my breath away. It has been a few weeks since I read some literary fiction, but this one has single handedly raised the bar for all literary fiction to follow. I have not been able to stop recommending this book to everyone. First off, I listened to this on audiobook, which normally is not my favorite way to read a book, but with Her Body and Other Parties there was a haunting quality to listening to these short stories spoken aloud. It helps that Machado writes in “imagine the sound” and when you hear that, the visceral reaction is out of your control. Secondly, the narrator for the audiobook is just perfect for this book, she has this short manner of speaking that makes the words come alive. 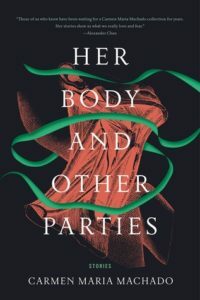 Her Body and Other Parties is a stunning and revelatory reading experience. There were moments where I felt like it was a mentor to me, a grieving partner, and a ghost of the future to come. In the first story alone we are introduced to the way women are silenced, discredited by the medical system – by doctors, by families, and by themselves. Machado says all the thoughts I have in my darkest hours, on nights I can’t sleep, and in the moments where I rage against the machine of patriarchy. She talks about the way women are taught to please and men are taught to take, the ways we forget and forgo our own identity, bodies, and desires. It dwells in the moments we buy into it, lean into the ideas that hurt us, or the times we cry because we have a sense of fulfillment that we deny, is pain rimmed, and leaves us wanting. It speaks of moments we think we know what we should be, when we mold ourselves to their contours, and we think we relish in that illusion of being whole, when in reality we were whole before they began chipping us away. I especially loved the imagery of the ribbon. Ultimately this is a collection that I know will strike a chord deep within many people, because we can each get some meaning, some sense of familiarity with these words and these moments of hidden thoughts. The collection is dark, and rich with a deep subtleness within, but also an exploration of life as a woman. It is eerie and haunting, exactly because of the way the words resonate so deeply within us, like the striking of a gong to awaken us from slumber. There are wounds, grief, suffering, and healing all within the lines and spaces of the pages. Machado interrogates issues of femininity, identity, motherhood, creativity, and the media. In this book is one of the best portrayals of motherhood simply because of its honesty, genuine feelings of doubt and those twilight moments of coded language and expectations. I loved each and every one of these short stories for different reasons: whether it was the inherent sexism in television, or the way women accept pain for beauty, or self-police our own desires. Machado is amazingly clever and her writing leaves you reeling with the sheer poignancy and talent. It is a true testament to the way words shape our lives. The prose is shocking and it echoes notes within yourself you never knew existed. Her Body and Other Parties will stick with you long after you finish the book, inhabiting your dreams and waking slumbers. The ending is a clash of natural forces and it demands your attention in a way that only the great books do. You can find this amazing book on Amazon(US), your local indie, and add it Goodreads. What’s the last book that touched your heart? Ahh, this sounds like a pretty intense read! I feel like I might read, in these stories, some things about myself that I’d rather ignore… I added this book to my TBR after seeing it in a Goodreads newsletter, so I’m glad your review confirms that was a good decision. YES! I am planning on gifting this to most of the people on my Christmas list…so I want the world to read it so I can talk to people about it!! !